The Capital Medical Society Foundation awards scholarships annually. 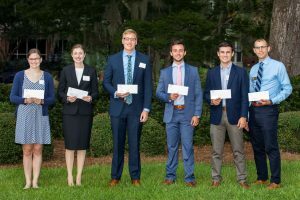 These unrestricted financial scholarships are made to first and second year medical students at the FSU College of Medicine and third and fourth year medical students at the Tallahassee Regional Campus of FSU College of Medicine on the basis of financial need. Applications are accepted each year in June. To apply, please download and fill out the 2019 Scholarship Application and return by mail based upon the application instructions.